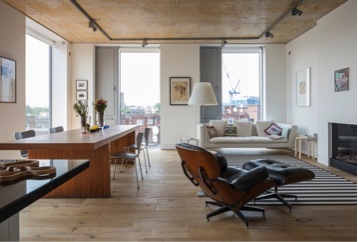 View the private collection of an artist and architect in east London. Join the Drawing Room directors for this special visit to the home of established artist, Susan Morris and architect Trevor Horne, to view the work of artists they have collected over the years. This is a personal collection that has evolved often through direct support to young artists, or support for non-profit organisations including works acquired through Drawing Room biennial fundraisers. Their collection has developed more by accident and exchange than by design and includes works by well established artists. Housed within a new building, designed and developed by Trevor Horne Architects, are six apartments, architects and artists’ studios. - This is a special event for our Patrons, to find out more about becoming one click here. - Exact location will be given to attendees, for more info on the event please telephone us on +44 (0) 207 394 5657.